Dr. Pedro Noguera inaugurated the 2008-2009 Ackerman Institute Alumnae/i Workshop series on Thursday, October 23rd with a stimulating and timely talk on “Understanding the Nature of Risk: Building Support for Children and Families in Distress.” Dr. Noguera is a professor in the Steinhardt School of Education at New York University and the Director of the Metropolitan Center for Urban Education. 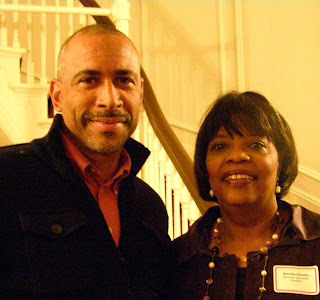 An urban sociologist, Dr. Noguera’s scholarship and research focuses on the ways in which schools are influenced by social and economic conditions in the urban environment. Dr. Noguera has published more than 150 research articles, monographs and research reports on such topics as urban school reform, conditions that promote student achievement, youth violence, the potential impact of school choice and vouchers on urban public schools, and race and ethnic relations in American society. Dr. Noguera said he did a lot of his work with schools and to understand schools, it was critically important to see them in a social context. He noted that although the United States has vast resources, it does not do the basics very well. By basics, Dr. Noguera said he meant such endeavors as teaching children from poor communities to read. He said that the schools often are the only safety net available to children. Dr. Noguera noted that the U.S. has the highest teen pregnancy rate of all industrial nations, that the U.S. homicide rate is higher than the death rate of many countries at war, and that more people per capita are incarcerated in the U.S. than in any other country at any time in history. Dr. Noguera said that the famous sociologist Emile Durkheim – the father of modern sociology – conducted a study of suicide years ago and found that suicide was closely tied to people’s sense of connection to their society. The more connected a person felt, the less likely he or she was to commit suicide. Dr. Noguera said that Emile Durkheim came to see suicide as a symptom of what he called anomie, a term that signifies an erosion, diminution or absence of personal norms, standards or values in an individual. The effect of this normlessness at both the personal or societal level is to introduce alienation, isolation, and desocialization because as norms become less binding for individuals, those individuals lose their sense of right and wrong. Dr. Noguera also cited the observations of Margaret Mead who, when she worked with groups in the 1960s, commented on the fragmentation of generations as a serious societal issue. In his opinion, both Durkehim and Mead were correct, Dr. Noguera commented, because we see in our society a breakdown of both institutions and families. Social isolation and alienation can lead to mental illness and, in certain circumstances, even death, Dr. Noguera explained. To illustrate his point, he spoke about a heat wave that occurred in Chicago in which a number of elderly people who lived alone actually died because they were so disconnected from their families and communities that there was no one around to see how the extreme heat was harming them. “There was no one to open the window or get them out of their apartments,” he said. However, older people who lived with others or were still involved in a community did well in spite of the dangerous conditions brought about by the heat because another person looked in on them and helped them. After September 11th, Dr. Noguera said, people experienced an increased sense of community and appreciated it. “There is real social benefit in social community,” Dr. Noguera said. What is needed, he explained, is to teach people emotional intelligence skills. These skills can be taught in schools, but one of the key questions facing society is how to teach them on an even larger scale.